Curiouser and curiouser. 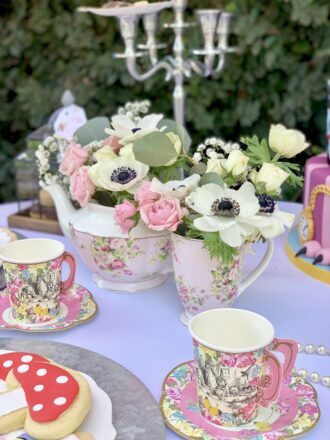 If the idea of an Alice in Wonderland tea party makes you smile bigger than a Cheshire cat, this gorgeous vintage style Alice in Wonderland birthday party is going to brighten your day. 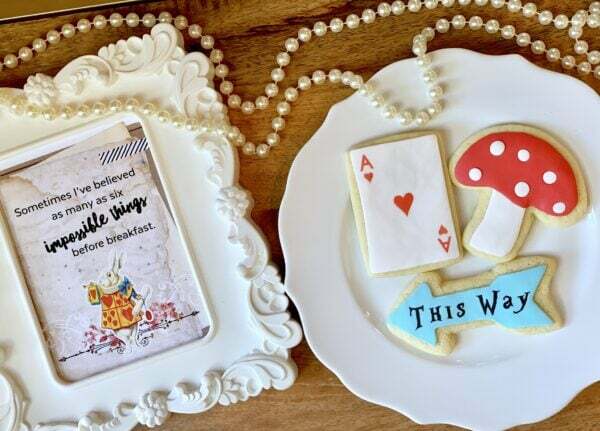 There are so many fun and fancy details, some delicious themed Wonderland cookies and more! Looking for more Disney inspired girl’s parties? 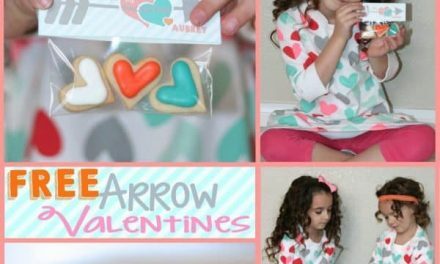 Be sure to also check out this Boho Chic party, these Flamingo party desserts, and these popular party themes for girls. 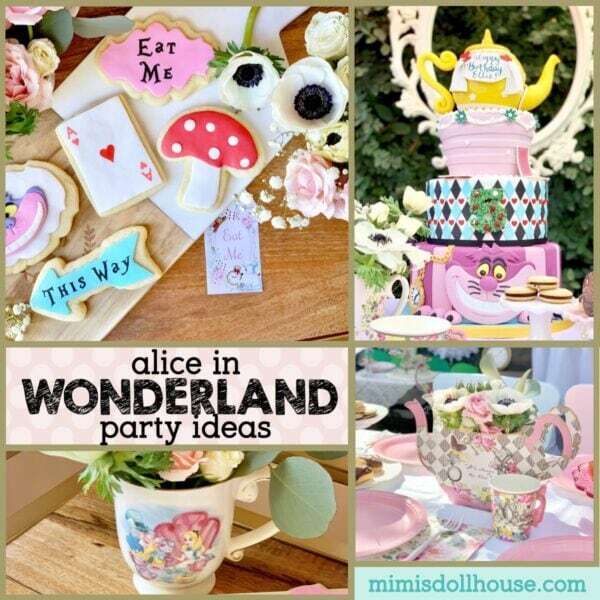 “My daughter Ellie asked for an Alice in Wonderland party and the party planner in me burst! Haha! This theme is so much fun and there is so much joy in going all out! To start, I knew I wanted to set the dessert table as a tea party tablescape. Chargers, plates, silverware, cups, chairs as the end caps. The plates became the serving trays for the cookies. 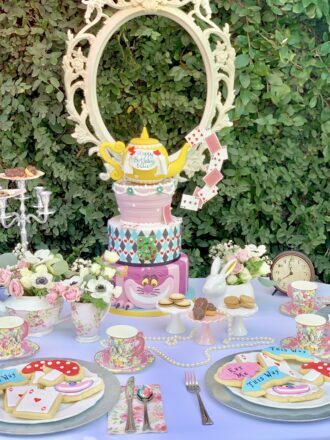 I also had a candelabra, vintage clock, white bunny and a tea pot as vases, bite size treats, macarons, “eat me” and “drink me” tags…all the things you would imagine at a Wonderland Tea Party. For the backdrop, I wanted a color block balloon garland in the main colors of the party. Play cards were hung on clear fishing line and dripping down from the red balloons! The kids table was also set as a tea party and had macarons and mini eclairs, as well as heart shaped watermelon for the Queen of Hearts, of course! Let’s dive into this fun party, shall we. There are so many adorable details. This idea is one of my favorites. The “painting the roses red” portion of Alice in Wonderland was always one of my favorites. This simple backdrop is beautiful and fits perfectly with the feel of the party. You can achieve this look by using artificial roses and depending on your party space, hanging the roses with fishing line or stapling directly into the wall. 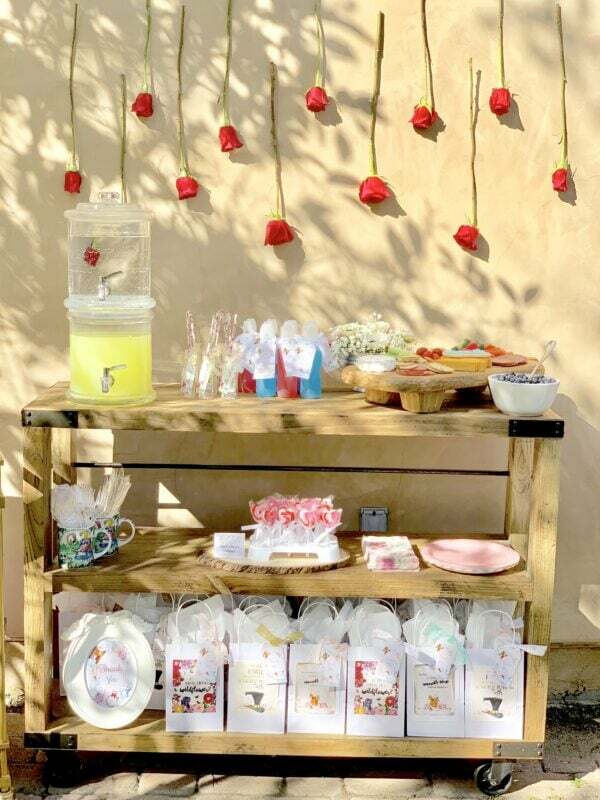 This cart is a great place to display party food, or like seen here, the fun favor bags! One of the fun parts of throwing an Alice in Wonderland party, is embracing the slightly off, odd, and eclectic. These free printables with quotes from the book are absolutely perfect for achieving that true “Alice in Wonderland” feel. They are one of my favorite details for sure!! Don’t you just love this adorable Teapot Centerpiece? 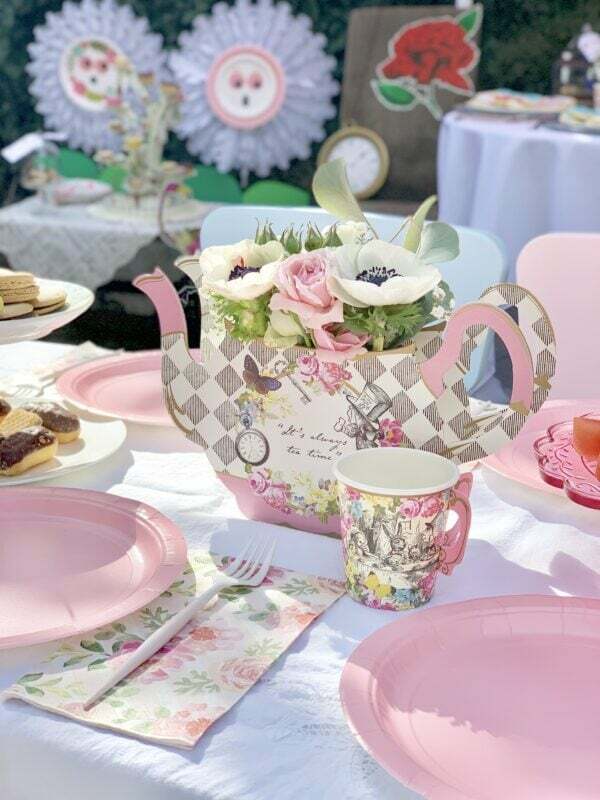 The pastel pink and black and white sketch design is adorable and its such a great way to set the tone for a Wonderland Tea party table. 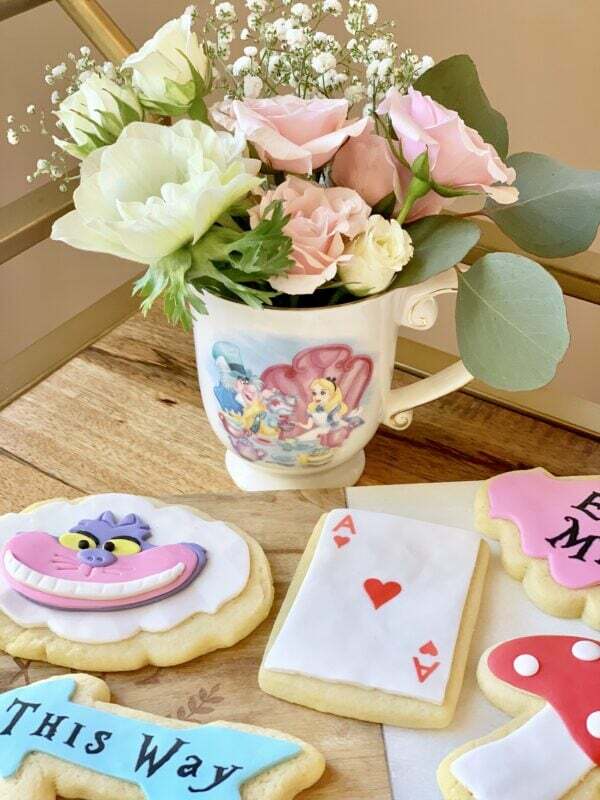 Little girls (and grown up girls for that matter) would be absolutely giddy to sit down for a tea party and have a gorgeous tea pot and flowers. 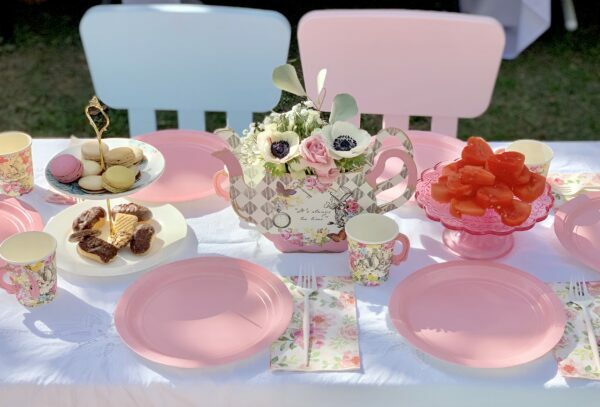 The coordinating Alice in Wonderland Tableware is perfection also…and of course you can always accent with Solid Pastel Tableware like Lori has done here with the solid pink plates. 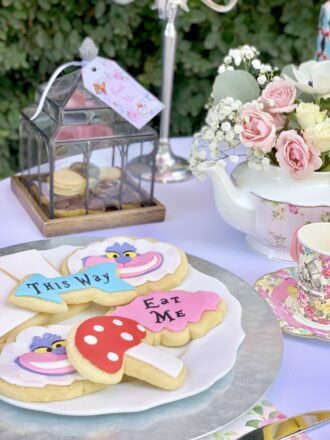 Not everything in a party, especially an Alice in Wonderland themed party, has to be perfectly matched. Sometimes having a little change up makes the table just that much more adorable! The cake is often the most talked about part of any party. Sometimes minimalism wins out and you go with a gorgeous naked cake or drip cake. But sometimes, you have an epic cake! 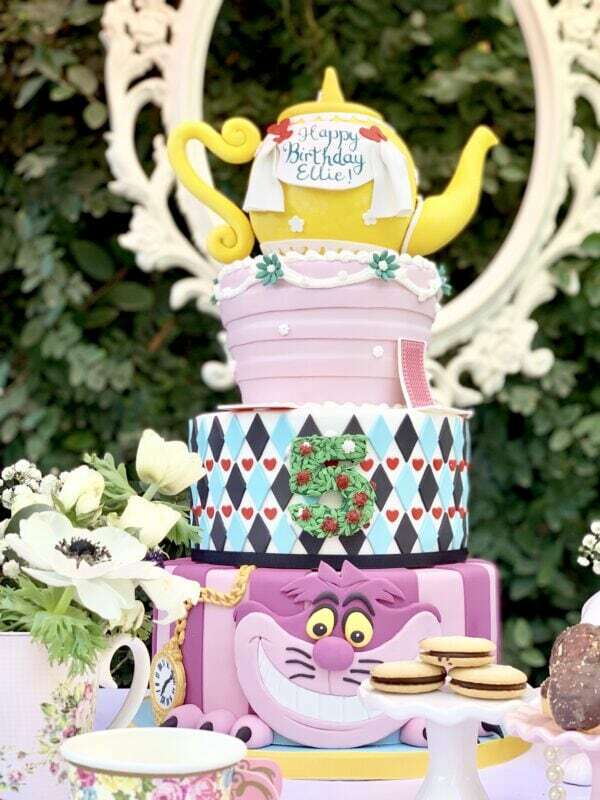 This cake is epic…and an Alice in Wonderland cake really needs to be epic. Alice would want it that way, right?? Each layer has it’s own Wonderland theme. The Cheshire cat at the bottom (with a perfect smile, of course). The card themed rose garden comes next (did you catch that the roses weren’t ALL painted red)? Then you have the cake and tea pot, it IS a tea party!! Absolutely stunning. I love when the details of a party are so perfectly thought out! The Alice in Wonderland cookies were not to be outdone by the cake. 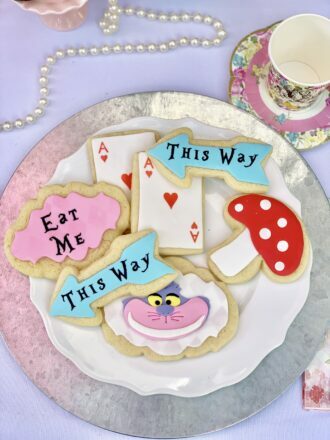 These Wonderland sugar cookies are such a fun and each have their own fun Wonderland idea. I think my favorite are the direction signs. of course…that Cheshire cat cookie is just begging to be eaten!! It’s important to remember in a party, that not all the food should be treats and sweets. It’s always a good idea to offset that sugar with some salty or healthy snacks. 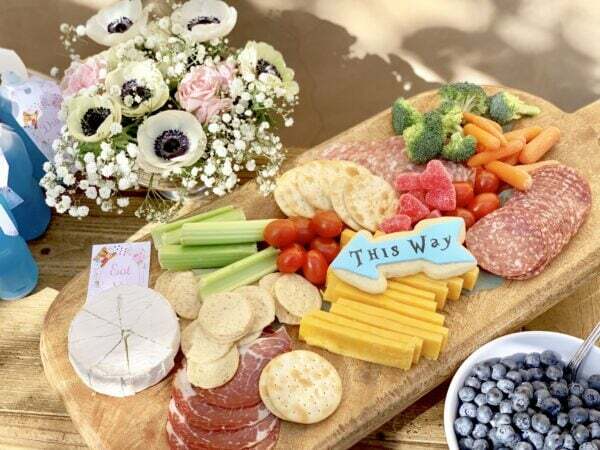 This meat and cheese tray is a great idea. I always include veggies and cheese at parties. 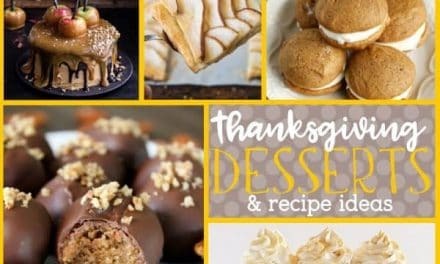 Often, there are many kids that actually go for those foods over the cupcakes and cookies anyway! 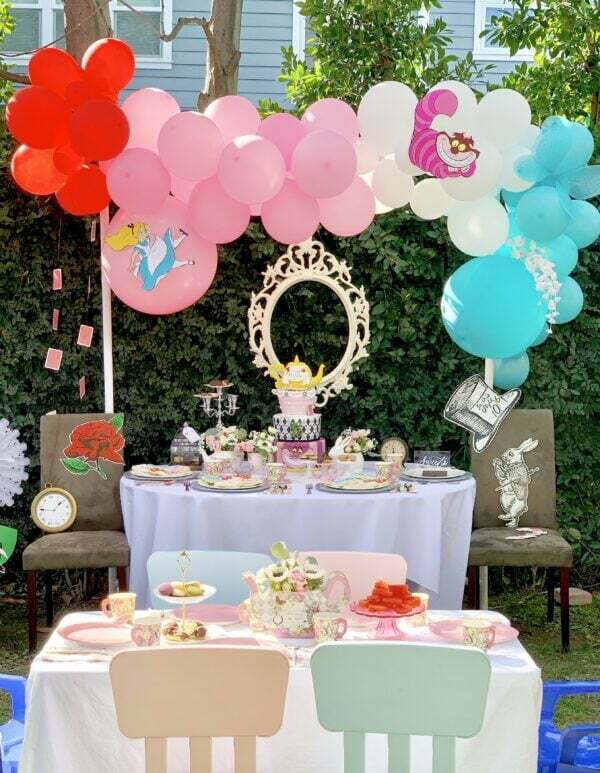 When throwing an Alice in Wonderland birthday party, the sky is really the limit on your creativity. You can have a simple, elegant tea party with funky twists…like this one. You can embrace the Tim Burton Wonderland and have your decor be darker and well, weirder! You can also focus on a simple color palette. That’s the best part of throwing a themed party. 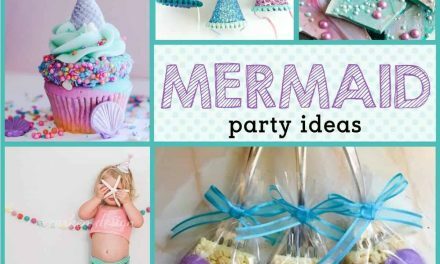 The party is a chance to have some fun and showcase a theme you or your little one absolutely loves!! These gorgeous tea cups and saucers are great alternatives to giving kids expensive tea cups! They work great with this party theme and have adorable artwork! Another fun idea for a backdrop is to useAlice in Wonderland Bunting Banners to accent your backdrop. Here are more shots of the stunning cookies and a close up of the adorable treat bags. 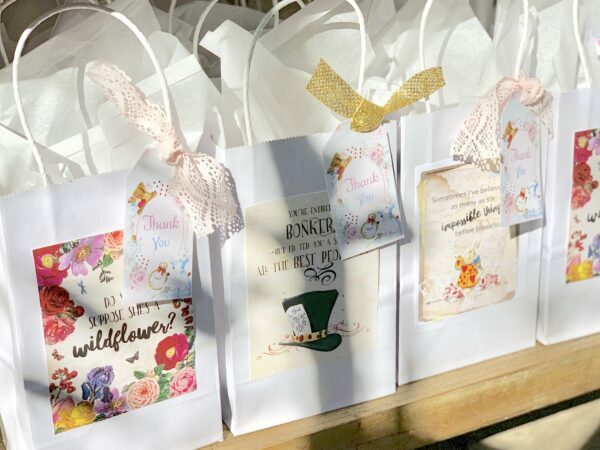 Party favors can be simple or over the top…but at the end of the day, as long as they are displayed with all the cuteness…your guests will love them! Here is another shot of the Teapot Centerpiece and the Alice in Wonderland Tableware. 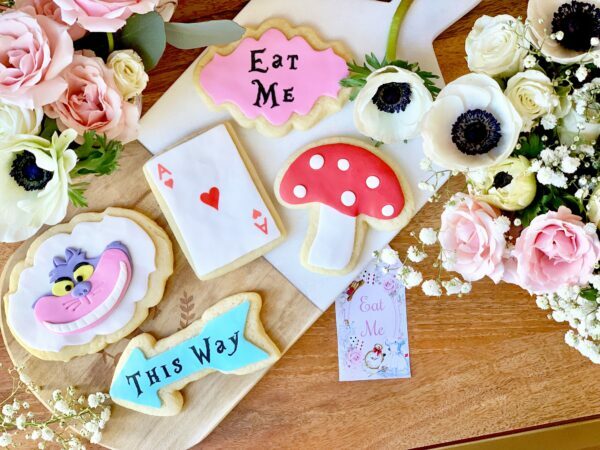 While you are having your guests play in their own little Wonderland…make sure to have some Alice in Wonderland Photo Booth Props that you can use to get adorable candid shots of your party guests mixed in with all your gorgeous party decor. What a wonderful party. Thank you for sharing it with us, Lori. 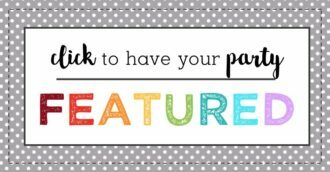 I hope you will swing by her site and check out all the adorable parties she creates!! Paper Party Props by Crafting Corner Co. 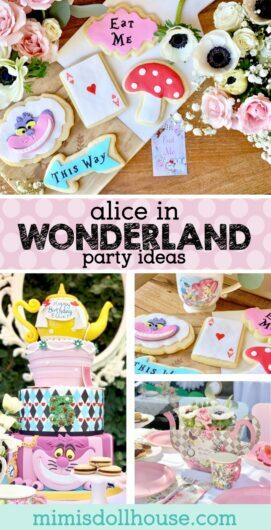 Thanks for checking out this fun Alice in Wonderland Tea party full of beautiful Wonderland party ideas! Yay! Thank you so much for sharing my daughter’s party! I had a blast with this one! 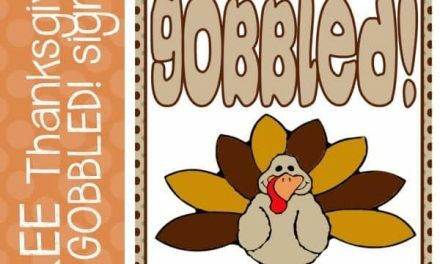 Appreciate you featuring it! Absolutely…it is an adorable party! I love all the details! Ah I just love party planning and themes! I don’t have kids yet but this makes me want them soon. I’m a sucker for a good themed party too! Oh my goodness! This is so adorable! Right! Lori did such a great job!! Wow! This is my favorite party you’ve shared. It’s perfect! Thank you! Alice in Wonderland is such a great theme!! Those cookies are ADORABLE!! What a great idea for my 3 year old!! They ARE adorable!! Let me know if you throw her an Alice in Wonderland party!! Oh my goodness this looks like the perfect party for a little girl! I love all of the decorations, especially the balloon garland backdrop, it looks so simple to do but adds the perfect touch! Balloons have become my favorite party details. You can do so much with them! !